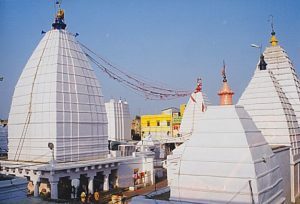 Baidhyanath Jyotirlinga Mandir is located at Deogarh in erstwhile Bihar, now Jharkhand. It is believed that this Jyotirling fulfills all wishes – spiritual as well as material. Hence, it is also called the Kaamna Ling. It is believed that this is Aarogya Baidyanath, where Shiv relieves people of their sicknesses. The temple complex consists of numerous other important shrines. In the holy month of Shravan, devotees undertake a rigorous 100-km pilgrimage on foot from Ajgaibinath (Sultanganj) in Bhagalpur district to offer holy water from the Ganges to the Shiva Lingam at Deoghar. Deogarh literally means the ‘ghar’ – house of the ‘Deo’ – God, ie the House of God. It is an ancient city. It is believed that the heart of Sati fell here, and is thus identified as one of the Sakti peetha. Deoghar has also been referred to by various names like Harda Peeth, Ravan-Van, Haritki-Van, and Ketaki-Van.